Amy Rees Anderson is the Managing Partner and Founder of REES Capital, an angel firm that provides entrepreneurs and business executives' support and guidance. 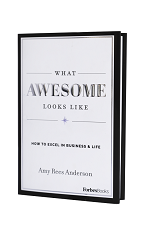 Amy is also an author and serves as a regular contributor to Forbes and the Huffington Post. Prior to founding REES Capital, Amy Rees Anderson was formerly the founder and CEO of MediConnect Global, Inc., one of the largest cloud-based health information exchanges. Amy led all aspects of MediConnect's business, including a worldwide workforce of nearly 2,000 employees. In March 2012, Amy successfully led MediConnect to being acquired by Verisk Analytics (VRSK) for over $377 million. Upon selling her company, Amy founded the IPOP Foundation (In Pursuit of Perfection), a charity focused on helping promote, educate and perpetuate entrepreneurship as a pathway to self-reliance. Amy is an in-demand public speaker, a respected mentor, and she lectures at a number of universities. She has been featured in the The Wall Street Journal, Forbes, Inc. magazine, USA Today, Fast Company, Bloomberg Businessweek and many other national publications as a result of her many accomplishments. Amy has been the recipient of a number of prestigious awards honoring her sharp business acumen and her company's growth and success which include being named a CEO of the Year by Utah Business Magazine as well as being a recipient of the prestigious Ernst & Young Entrepreneur of the Year Award. Amy is also the first woman ever to be named BYU's Entrepreneur of the Year. In 2015, Amy received an honorary Doctorate in Humane Letters. Amy currently serves on the boards of numerous organizations, including: Governor Herbert's Advisory Team, Chair of Utah Valley University National Advisory Board for Woodbury School of Business; University of Utah National Advisory Board for David Eccles School of Business, Center for Medical Innovation, and Technology Commercialization Board; Brigham Young University Founders Board and BYU's Wheatley Institute Ethics Advisory Council; Utah State University Clark Entrepreneur Founders Board; Huntsman Cancer Foundation Executive Council; Sandy City Chamber of Commerce; and The Hale Center Theater Board.